Fitted with a cabinet to place your coats and keys, and leading to the three bedrooms, family bathroom and lounge. A door across leads to the kitchen making it convenient to access when coming from the bedrooms. A spacious room with double aspect windows with views to the side and city views to the front. A large airy and well ventilated room with adjacent dining section and French windows that lead to a moderate sized balcony. As part of the open plan design from the lounge, but separated by a half wall (which could be closed up or removed with minimal work), the kitchen is a fitted with a mini-fridge, washing machine, gas hob, oven, cabinets and a water cooler. An easy access door leads straight to the hallway, while another door leads to a balcony with a BBQ pit, great to grill in the summers! A generous double room with fitted wardrobes, air conditioning, large single aspect window and a door leading out to a shared balcony overlooking the city skyline with the mountains as a backdrop. This bathroom makes up for being a single by having both a shower and a corner bath in it! Also fitted with WC and basin the room is tiled throughout with attractive ceramic tiles. Another large double bedroom with fitted wardrobes and a single aspect window with city views on one side and French windows leading to the shared balcony with mountain views on the other. A single bedroom with fitted wardrobes, single aspect window, suitable as a home office or a kid’s lounge. 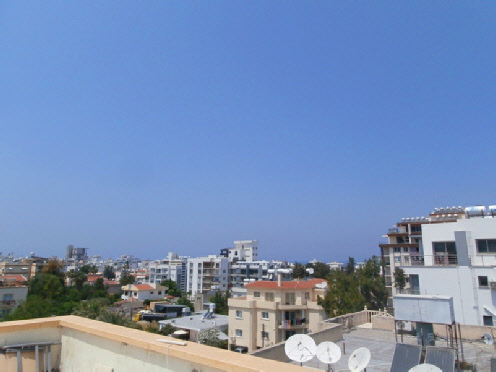 This lovely top floor apartment in its strategic location right within walking distance to all the shops, restaurants, school and public transport stations, city center, clinics, vets and highway will only appreciate with time as Kyrenia becomes ever attractive for investors and holiday makers. As a rental, this property would easily fetch an estimated £400 monthly! Kyrenia (Girne) is possibly the best holiday area on the island, bringing history to visitors while entertaining them. You can catch the nostalgia by visiting the historic places and travelling around its streets, sensing the smells of jasmine and orange blossom. You can taste its delicious cuisine in the plentiful restaurants and sip your coffee at coffee houses during summer evenings. You can enjoy an environment of people laughing, or let the smell of the sea and the sound of the waves dreamily waft you away to other worlds. With quick and easy access to an array of shops, bars, restaurants and the bus station, this 3 bedroom top floor apartment sits comfortably in a strategic location that not only allows great resale but also quick rental potential. The living room is a bright and airy room with French windows that lead to a balcony; the dining area sits in-between the kitchen: a simple but fully fitted space with a balcony and outdoor BBQ pit. Down the hall, all three bedrooms and the family bathroom (which has a shower and bath) are located. The Master bedroom is a large room which has a shared balcony with the second bedroom, giving mountain and city views. With its central location all the amenities and the popular shopping district, the rental potential on this property serves as a great investment incentive. The title deeds are shared with no VAT to pay.